On Feb. 19, 2019, Lindsey Vohn's final race at the World Ski Championships in Åre (SWE) ends with a Bronze medal in Downhill, according to her Twitter account. Olympic gold medalist Lindsey Vonn has officially announced her retirement to skiing on an emotional post to her Instagram and Facebook due to the seriousness of her injuries. “Honestly, retiring isn’t what upsets me. Retiring without reaching my goal is what will stay with me forever. However, I can look back at 82 World Cup wins, 20 World Cup titles, 3 Olympic medals, 7 World Championship medals and say that I have accomplished something that no other woman in history has ever done,” said Vonn. Vonn grew up in St. Paul Minnesota and became the sports star ascent of her father a former competitive skier. Vonn was only a toddler when her father, Alan Kildow first put her on skis. Following her passion for skiing, Vonn then packed up her skis and moved to Colorado in the late 90s. 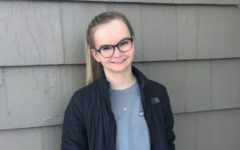 Vonn had her first glorious victory when she won the slalom at Trofeo Topolino in Italy, which made her the first of American women to receive that honor at 14 years old. From there Vonn’s name only grew. In her youth, Vonn continued to excel and signed on with Team USA. The next year Vonn won her first silver medal at the Junior World Championships. In 2005 Vonn signed with her new coaching team and geared up for the 2006 Olympics. Sadly, at practice, Vonn suffered an injury that lead her to a hospital stay. Vonn still competed but received 8th overall in the downhill skiing category. Following her downfall at the Olympics, Vonn made her comeback by winning 3 consecutive World Cup championships. That, however, was not the height of her career, in the 2010 Olympics Vonn achieved her lifelong dream and received a gold medal in the downhill and bronze in Super G in Vancouver, Canada. Following the 2010 Olympics Vonn continued to dominate the skiing world with her impressive runs. 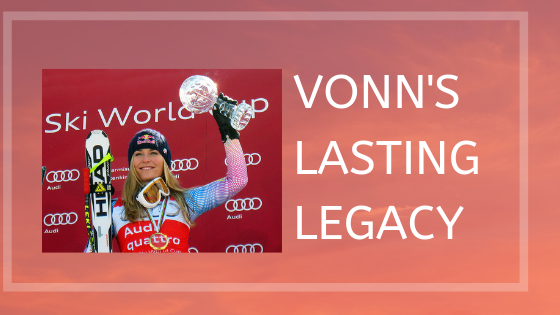 In February of 2013, Vonn endured a freak accident at the World Championships in Austria. The injury was long lasting and caused Vonn to withdraw from the 2014 Olympics with a sprained MCL and a torn ACL. Finally, after four long-awaited years, Vonn made her comeback. At the 2018 Olympics in PyeongChang, South Korea. Vonn gave it a solid run but unfortunately, Vonn made a simple mistake which leads her to a 6th place finish in the 2018 Olympics Super G event. In her downhill event, Vonn made a comeback by winning bronze in the downhill and became the oldest woman to receive a medal in an alpine event. At the end of 2018, Vonn endured another crash leading her to six weeks of rehab. Vonn still managed to compete in skiing even in January and officially announced her retirement from skiing in February 2019. Vonn may have not reached her goal of 86 world cups or won another gold medal but to say she didn’t accomplish anything would be an understatement. “A part of me is missing when I can’t ski, but I’ve learned there’s more to define me and make me happy, like stand-up paddling and Jet Skiing – things I’d never done before. Or being with people I love and just enjoying life,” said Vonn.